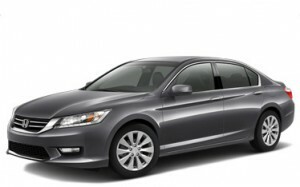 Unlike most mid-size sedans available to Central Illinois Honda Dealers, the 2015 Honda Accord comes with a V6 engine option alongside its standard four-cylinder offering, and if you’re looking for a high-powered alternative on your mid-size sedan or coupe, it should certainly do the trick. But what’s the difference between the Accord V6 and four-cylinder, and is it worth the drop in fuel economy for the added power? Obviously if you’re looking at the 3.5L V6 on the 2015 Accord, you’re looking for a car with more power, and you’re going to get it. The 2015 Accord’s four-cylinder engine is rated at 185 hp and 181 lb-ft of torque, specs that aren’t bad at all for a mid-size sedan. Upgrading to the 2015 Accord V6 raises the power output to 278 hp and 252 lb-ft of torque. That’s more powerful than many family-sized SUVs and minivans. We think that’s a small price to pay to be able to have a high-powered mid-size sedan in your garage, don’t you? Did we mention that each Accord V6 model comes with leather upholstery, heated front seating, and some of the latest in automotive convenience and safety technologies? That’s just another benefit of the EX-L and Touring trim levels. We can compare stats all day, but the fact is that if you’re upgrading to the 3.5L V6 engine on your 2015 Honda Accord, you’re going to want to take it for a spin around the block to get a feel for it. And we want to help. Visit a Central Illinois Honda Dealer near you today and let us put you behind the wheel of the 2015 Accord; we’ll let you try both the four-cylinder and the V6 so you can see the difference.